Ralph will talk on Cyber-Physical Attacks and National Security. 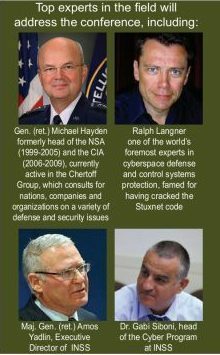 The conference features a rather unique lineup of Stuxnet expertise as General Michael Hayden and General Amos Yadlin will also be speaking. Hayden was CIA director from 2006 to 2009, and Yadlin headed Aman (Israel Military Defense Intelligence) from 2006 to 2010. Ralph will give a keynote address in the Cyber Warfare track of the summit.